There are few things more American than Jeeps and pickup trucks. 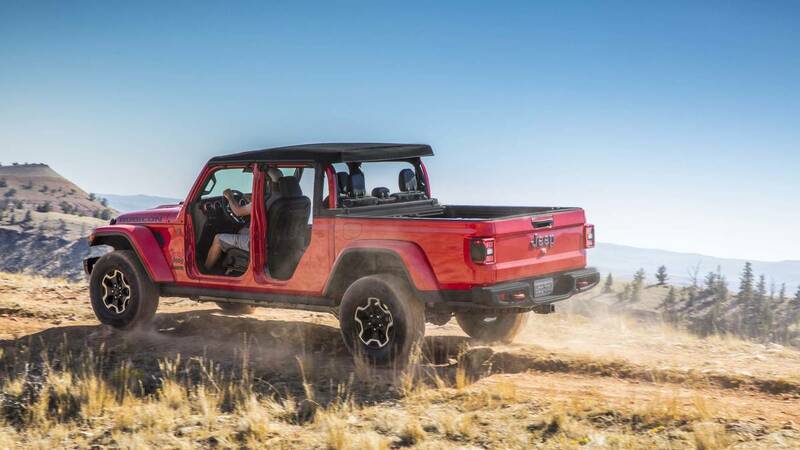 Combining the two with the brand-new 2020 Jeep Gladiator, is like washing down a slice of apple pie with a cold can of Bud Light while watching fireworks on the Fourth of July. Jeep has lots of history with pickup trucks, having first introduced the Willys-Overland Pickup way back in 1947. The Forward Control followed in 1957, but it wasn't until the 1963 J-Series Gladiator that the brand truly had a proper pickup to compete with the likes of Ford and General Motors. 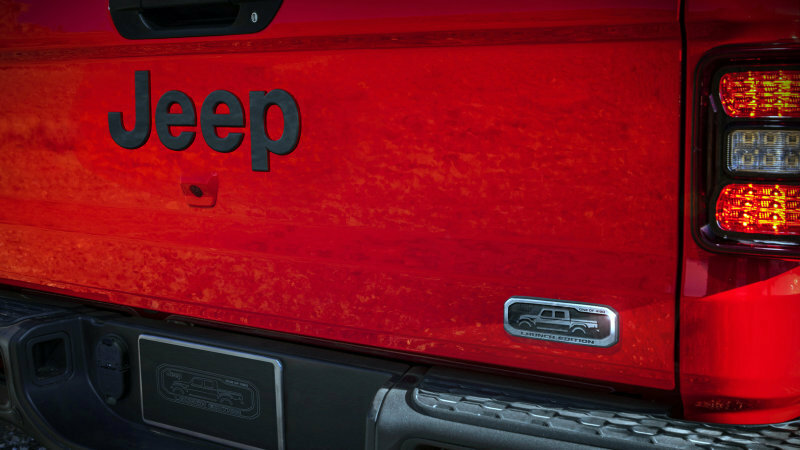 Jeep's last truck, the Comanche, sold more than 190,000 units over its eight-year lifespan, but the image that the majority of Jeep's most ardent fans conjure up when they think of a seven-slotted pickup truck isn't the newer unibody Comanche, it's the older body-on-frame Scrambler. Such is the power of the iconic grille and round headlights. 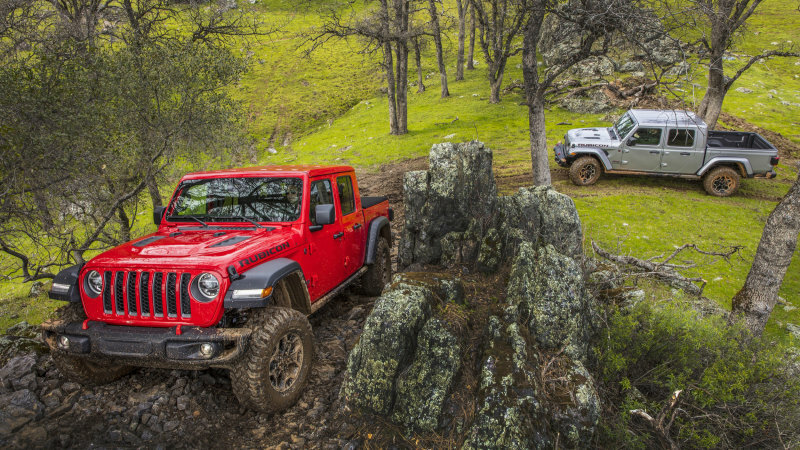 So it's no surprise that it's the CJ-8 that Jeep seeks to mimic with its new Gladiator, following a similar recipe of lengthening the frame of its best-selling Wrangler by 31 inches and grafting on a bed. Jeep drew on the experience of corporate cousin Ram, borrowing the 1500's rear suspension design for use in the Gladiator. Fortunately, the end result doesn't feel like a parts-bin special assembled solely to fill a marketplace need. This is an honest-to-goodness pickup truck competitor entering a super-hot midsize market. And it's doing so with a seriously unique sense of style. Of course it's got the Wrangler's grille, modified with larger openings to let in more air to fulfill the cooling needs of a pickup truck. The rest of the bodywork back through the front doors is cribbed straight from the Wrangler. Only one configuration is available, a four-door model with a five-foot truck bed. 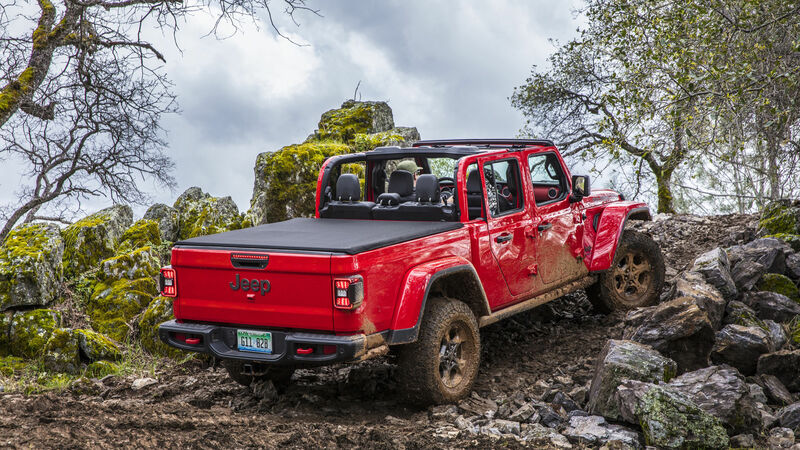 While all of its competitors, including the Toyota Tacoma and Ford Ranger, offer similar four-door utility — and importantly also offer an extra foot via their long-bed options – nobody but Jeep offers a pickup truck with a removable roof, let alone a fold-down windshield or doors that can be left behind in the garage. An optional portable Bluetooth speaker sits in a charging cradle behind the rear seatback, and flipping up the rear seat bottom reveals a bin that is optionally available with a locking cover. Jeep mentioned the possibility of filling these up with ice to keep drinks cool on a hot day. There's ample space inside the Gladiator for four adults to sit comfortably. At 38.3 inches, there are a couple more inches of rear seat legroom in the Jeep than in any of its competitors. We had no trouble putting one six-footer in the rear seat behind another similarly tall person in a comfortable driving position. Front and rear headroom are also class-leading. 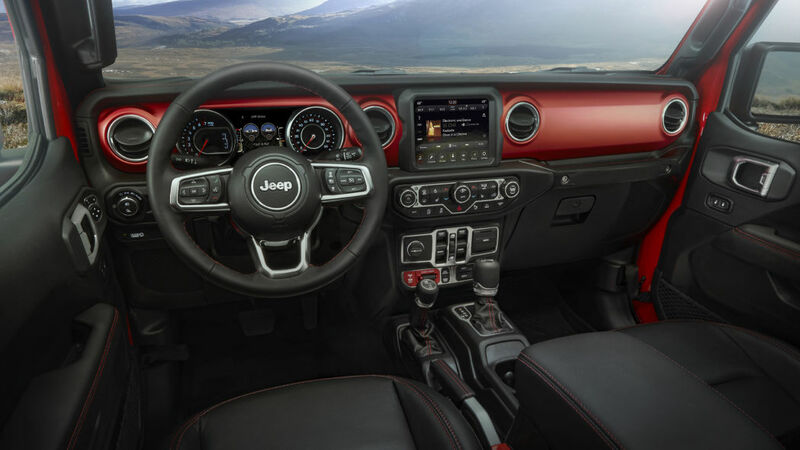 A 5.0-inch touchscreen comes standard with the Gladiator Sport, with larger 7.0- and 8.4-inch options available. Android Auto and Apple CarPlay are available on the up-level Uconnect systems. A rear backup camera is standard, and a front-view camera with an integrated cleaning nozzle that provides a close-up view of the terrain ahead is optional for those who plan on doing serious off-roading. I saw one of these in a parking lot back in February. Fun looking toy if I had the money and space, I'd own one. $60k for a Jeep, FCA getting pretty good at high dollar special editions! Last edited by euRoSport; 04-08-2019 at 10:37 PM. Right Hand Drive?? Yes or no and if so why not or why only specific countries.